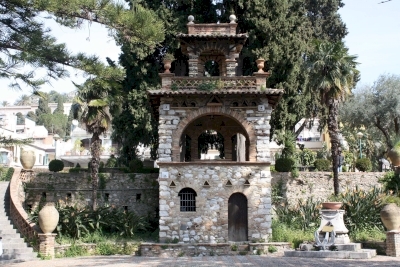 Taormina and Isola Bella is part of the Tentative list of Italy in order to qualify for inclusion in the World Heritage List. March 2019 - After two days in and around Catania, we went further north to Milazzo. That day we stopped in Taormina. You can park next to the Isola Bella and take the cablecar to the twon. Bad luck, it was in renovation, when we were there. However a bus took us up to town. Taormina is a nice old city with charming houses, churches and Piazzas, but also many souvenir shops and snops in fancy jackets. Taormina seems to be a tourist hotspot. It’s easily reached over the highway from Catania or Messina. The town itself is very pleasant for a stroll and offers loads of restaurants and shops. 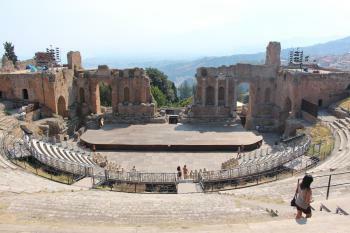 The Greco-Roman theatre is clearly the highlight of Taormina. Spectacular is rather the location in the hills, overlooking Sea and Mount Etna, than the structure itself. Clearly there are more impressive theatres around (e.g Orange or Merida). The other remains within the city are rather small. I also visited Isola Bella. It’s a tiny island a few meters off the coast. You reach it by removing your shoes and walking a few steps through the sea. There is an entrance fee (4 EUR) but really not much to see despite the view. I did not understand the OUV of this island. Taormina is a beautiful destination for a quick weekend break. Great food too. Yet I don't think it merits a WHS status.